Plans to build three new bridges across the River Orwell in Ipswich have been scrapped due to spiralling costs. The Upper Orwell Crossings project was launched in 2015 at an estimated cost of around £97 million. However, the latest report says it'll be closer to £140 million. Suffolk County Council has been unable to secure the extra funding and has ended the project. 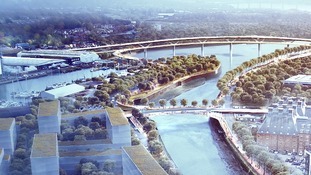 The council is hoping to submit plans for two smaller bridges instead. “It is very disappointing that we have been unable to secure any additional funding for the Upper Orwell Crossings and that the existing project will have to stop with immediate effect. "Suffolk County Council remains fully committed to the future development and continued success of our county town. The Upper Orwell project was aimed at allowing the redevelopment of the wet dock island site along with relieving congestion in Ipswich and on the A14. It was also hoped it would spark generation in the south of Ipswich.